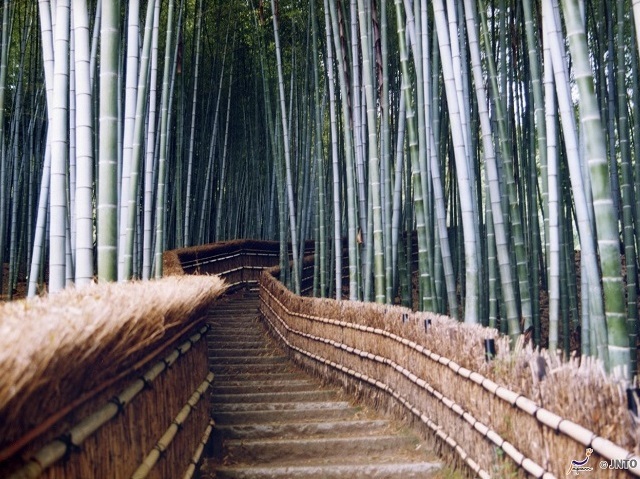 Arashiyama Bamboo Grove - There are many bamboo groves to see when you tour Japan, but this particular one in Kyoto is especially breath-taking. As the writers from TraveloCafe, an online travel blog, said, "We discovered an incredible feeling of tranquility mixed with just the right amount of mystery." You may even see some foxes and cats wandering around the area. Kinkaku-ji Temple - This three-story Zen temple has two floors that are covered in gold leaf and photograph gorgeously. In addition to the structure itself, there's a peaceful pond and garden on the premises that provide plenty of natural beauty. Overall, this is an attraction that combines rich history and wonderful sights, meaning it's a must-see destination for photographers and travelers. Philosopher's Path – "The path follows a canal which is lined by hundreds of cherry trees," states japan-guide.com "Usually in early April these trees explode with color, making this one of the city's most popular hanami (cherry blossom viewing) spots." You can catch some of these gorgeous attractions on Japan Deluxe Tour's Golden Route of Japan tour. This five-night Japan vacation tour gives travelers the opportunity to experience unforgettable attractions in Kyoto, Tokyo, Nara, Hakone and more. It includes 10 meals, ground transportation, round-trip airport transfers and access to an English-speaking tour guide — all for an affordable price. Check out our website today to learn more!